My guardian filed a small claims court case on my behalf. Inexplicably, the case has disappeared off of the State of CT Judicial Branch website. The small claims clerk and four attorneys have not been able to explain to my guardian why this happened. Below is the case when it did appear. As you can see Magistrate Francis Charlton dismissed the case on 8/7/09 due to “lack of jurisdiction/malpractice suit.” Magistrate Charlton stated he used to sit on the CT Unfair Trade Practices Commission (CUTPA) and recommended that my guardian to file a lawsuit in Superior Court, as this was a malpractice case. My guardian took the Magistrate’s advice and later filed in Superior Court (scroll down to read that case). History: My cat, Simba, is a 13 year old spayed, indoor female. She is an only pet. She has always been healthy and happy and ate very well. She began licking her teeth and I took her to Donald DeForge, VMD at Silver Sands Veterinary Hospital in Milford, CT on 12/15/08. He told me that she was in “severe pain” and had “exposed nerves in her teeth” and needed extensive oral surgery immediately. On 12/15/08, he told me she had osteomyelitis prior to taking any dental x-rays (possible violation of CVMA code of ethics section 3c, x – see attachment M2). I expressed that she didn’t act sick or in pain and his reply was, “cats are very good at putting up with their pain for years and you will never know it.” I expressed to him my concern about anesthesia and being sedated for a long period. He said, “I hear that all the time. She will be fine.” (possible violation of CVMA code of ethics Section 3cviii – see attachment M2). He then asked me if I wanted him to be her vet after the surgery to which I replied, “Yes.” This agreement is reflected as ‘courtesy discount’ on some of my receipts (see exhibits A1, A2, A3). He performed major oral surgery on Simba on 12/16/08 (see exhibits B1, B2, B3). He sent her home that night. She was in severe pain and would not eat. I called Silver Sands Vet Center on 12/17/08 and they asked me if I could get a small syringe into her mouth. I stated I couldn’t because I was afraid I would disrupt the extensive amount of stitches in her mouth and cause her more pain. I was told to bring her back to Silver Sands Hospital that night, which I did. Donald DeForge, VMD kept my cat at his hospital from 12/17/08 to 12/29/08 and had her on IV. I telephoned his facility daily. The majority of the times he would not speak with me or return my calls and had his vet techs relay messages back and forth. I repeatedly asked to visit Simba and was told I could not (possible violation of AVMA policy II,A – see exhibit T1.). I insisted Donald DeForge, VMD speak to me directly. I told him she was a cat I got at a shelter and I was afraid she would think I abandon her. He said, “She stays here or you take her home. No visiting.” (possible violation of CVMA code of ethics section 3c,xv see exhibit M2). Because I didn’t have anywhere else to take her at the time, I left her there as I knew she was sick and in pain. He said I could pick her up on 12/26/08. On 12/26/08 in the morning he called to tell me he was not releasing Simba because she had a sinus infection and he would keep her a few more days. I finally was able to bring her home on 12/29/08, with what appeared to be a sinus infection. She began eating less and less food each day that week. I telephoned Silver Sands Vet Center and Donald DeForge, VMD told me she was being stubborn and to “put her in a dog crate with her food and litter in a separate room and ignore her for 8 hours.” ( possible violation of AVMA policy IIA, F, H – see D). She ate nothing and I daily called his facility to report this. After several days it then became very apparent to me she was very sick. (since that time Simba has been diagnosed with pancreatitis, which was the reason she was not eating, see exhibit E1, E2). I telephoned Silver Sands and insisted on speaking to Donald DeForge, VMD. I told him of the extreme concern and his reply was, “These are my urgent care hours. This is not urgent care. Call me tomorrow.” (possible violation of AVMA policy F, A3 – see exhibit T1). I telephoned the next day crying and begging the vet tech to have the vet look at my cat. They told me to bring her in on 1/4/09, which I did. Donald DeForge, VMD then inserted a feeding tube into my cat, without discussing it with me. On 1/5/09 at 7:00am he telephoned me to tell me Simba was anemic and I had to transport her to VCA Norwalk. I picked her up and took her to VCA. We were there all day. Simba was seen by Dr. M. Jason Goodwyn and Dr. Beth Whitney. Dr Goodwyn informed me that Simba was not anemic. He determined this through a human scored blood test. I called Silver Sands Vet Center to tell them this and the vet tech relayed the message to me that, “ Dr Deforge is concerned about the discrepancy in blood results and because of this doesn’t want you to bring her back here.” I informed Dr Goodwyn of this comment. Dr Goodwyn gave me feeding tube instructions and asked me to follow up with Dr Whitney, an internist there, in a week. Because of our schedules I was unable to see Dr Whitney and could only see Dr Dianne Kitrell who, thankfully, agreed to see Simba. On 1/6/09 I received an email from Donald DeForge, VMD stating that he did not want to see Simba for 30 days and that he was a “surgeon” and not a “medicine specialist.” (see F, possible violation of AVMA policy E, IIID2 – see attachment T1). She has been followed by Dr. Kitrell at VCA Norwalk who is working in cooperation with a new vet I have taken Simba to. (I have intentionally redacted the name of my new vet from any attachments because right now Simba’s medical care is of the utmost importance). Simba has been diagnosed with renal disease (exhibits G1-G10 ChronologicalLabResults), which was not present prior to her oral surgery at Silver Sands Vet Center, pancreatitis (exhibits E1, E2), and still is on a feeding tube. She also has respiratory problems. I have been told by the vets I have seen that kidney failure can be caused from being under sedation for too long a period of time (Simba was sedated for three hours) and from being deprived of food for too long a period of time. Pancreatitis often is caused by shock and trauma (extensive surgery/not being able to see me to for 12 days). Since her surgery by Donald DeForge, VMD Simba has been seen by five vets: three at VCA Norwalk and two at her new hospital. All are concerned about what has happened to her at Silver Sands Vet Center and are very helpful. These doctors work in communication and concert with one another in a professional manner. This is something Donald DeForge, VMD stated he was unwilling to do in his 1/6/09 email (possible violation of AVMA policy IIA, IIB, IIE, IIH, IIID2- see exhibit T1). Currently Simba’s prognosis is guarded. Her dental x-rays have been reviewed by four separate veterinarians: a general practitioner, an internal medicine specialist, a radiologist, and a Diplomate of the American Veterinary Dental College. All have stated that an impression of osteomyelitis is not obvious upon review of the x-rays. Their names can be furnished upon request. I have spoken to two Diplomates of the American Veterinary Dental College (AVDC), Dr Laura Levan, of Veterinary Dental Services and Dr Alexander Reiter, Chief, Dentistry and Oral Surgery Service, Ryan Veterinary Hospital, who informed me (post-op), “A definitive diagnosis of osteomyelitis can only be made when bone tissue is sampled and histopathologically evaluated (plus/minus culture of microorganisms).” It should be duly noted this was never performed on Simba by Donald DeForge, VMD. I am also told “there is one radiograph that seems to have been obtained after extraction of several teeth, showing some root remnants being left in the maxilla.” It isn’t clear to me or others looking at the x-rays if they were taken pre-op or during the surgery itself. Simba’s oral stitches had to be removed, under gas sedation, by my new vet on 1/26/09 who observed the type and amount of stitches used. I was told the original stitches used by Donald DeForge, VMD were not dissolving, as my report from Silver Sands states (see exhibit c). The gums were trying to heal around the stitches and the stitches became embedded into the gums. Concern 1: Donald DeForge, VMD kept Simba at his facility for two weeks and refused to allow me to visit her, despite repeated attempts. In my opinion, this is inhumane. Animals need contact with their owners to get well. The AVMA states in their policy, “Animals should be cared for in ways that minimize fear, pain stress and suffering” (T1 – possible violation of AVMA policy IIA, Possible violation of CVMA code of ethics section 3c,xv – see attachment M2). Donald DeForge, VMD stated in his 1/6/09 email he didn’t want to see Simba for 30 days after he discharged her. He had agreed to be her primary vet prior to this email and I am confused why he would make such a statement. AVMA policy states, “…and the veterinarians have begin patient care, they must not neglect their patient and must continue to provide professional services related to that injury or illness within the previously agreed upon limits” (possible violation of AVMA policy IIE – see exhibit T1). Also the AVMA states, “The former attending physician should continue to provide care, as needed during the transition”- possible violation of AVMA policy IIID2 – see exhibitT1). Donald DeForge, VMD had me put my cat in a dog crate and ignore her for 8 hours. I later learned she had pancreatitis (which can be caused by trauma and stress) and this is why she was not eating. He did not run any tests on her or suggest any to find out why she was not eating. AVMA policy states, “Veterinarians should first consider the needs of the patient: to relieve disease, suffering or disability while minimizing pain and fear” – possible violation of AVMA policy IIA – exhibit T1). Donald DeForge, VMD performed major oral surgery on my cat, which I now believe, after showing four vets her xrays, was excessive and extreme . He did not discuss medical options to surgery and never discussed the complications of the surgery he performed. When asked what complications were he stated, “There aren’t any. She will be out of excruciating pain and will live a happy normal life.” (possible violation of CVMA code of ethics section 3 c, viii – exhibit M2). Looking back on it, Donald DeForge’s presentation of the urgency of the ‘needed’ surgery made me feel under extreme pressure. He repeated, “She is in excruciating pain” several times and I was crying in front of him. He made me feel that I “didn’t have choice” and if I hadn’t let him operate on Simba I would be leaving her in excruciating pain. Donald DeForge, VMD characterizes himself as a veterinarian but then in his 1/6/09 email characterizes himself as a surgeon and refused to care for Simba for 30 days (see exhibit F). The name of his business is “Silver Sands Veterinary Center Primary ER and Urgent Care.” If Donald DeForge, VMD is a vet and is advertising himself as an urgent care center and ER, I would certainly hope he would know about medicine. According to his email, he doesn’t. AVMA policy states, “advertising by veterinarians is ethical when there are no false, deceptive or misleading statements” – possible violation of AVMA policy XB – exhibit T1). Concern 2: Donald DeForge, VMD did not disclose to me that he never completed a residency or internship in dentistry or oral surgery. When I asked him about his education and experience his answers were broad, “I have been doing this for many years,” “I perform oral surgery all the time,” “I specialize in dentistry,” “people bring their pets from other states to me.” (possible violation of AVMA policy IIC, IID, possible violation of AVD policy exhibit L, possible violation of AVDC policy exhibit J1). In the 2008-2009 CVMA directory (see exhibit H1, H2, H3), Donald DeForge, VMD is listed as a Diplomat with the AVD College in Dentistry and Oral care. He is not a diplomat. He does not belong to the College. He is a Fellow with the Academy of Veterinary Dentistry. This is a possible violation of Section X, B of the AVMA policy- exhibit T1). There are no members of the AVDC in the state of Connecticut (see list of AVDC Diplomats – exhibit I1, I2,I3). AVMA policy states, “advertising by veterinarians is ethical when there are no false, deceptive or misleading statements” ( possible violation of AVMA policy XB – T1). The actual URL name of his website (www.theventdent.com) is misleading in and of itself, in my opinion. It is clear to me now that Donald DeForge, VMD is a researcher and academic and may be misusing the term “specialty practice in dentistry.” Both the AVDC and the AVD have a strict policy (exhibit L) about this. You will also notice that Donald DeForge, VMD has what appears to be two businesses: “Silver Sands Veterinary and ER Center” and “The CT and NY Specialty Centers for Oral Care.” He did not function as an ER for Simba when she would not eat and he is not permitted to be a “specialty center in oral care” according to both the AVDC and the AVD. Concern 3: Donald DeForge, VMD repeatedly told me he would not allow Simba to come home because I was on Coumadin and “she might scratch me .” He placed a large warning sign on the front of Simba’s medical chart stating this. He repeatedly said, “You’ll get yourself in big trouble if she scratches you.” I repeatedly informed him that I was her owner for 13 years and in that time she never scratched me. He told me he would not allow her to return home without medical clearance from my doctor. He also refused to prescribe liquid medications to her for the same reason. I informed him that he was not responsible for what occurred in my home and if he felt more comfortable I would put it in writing that I would hold him harmless if I was scratched at home. He insisted on a medical note from my doctor. I called my physician and spoke to her secretary who thought it was a very bizarre request from a vet. She stated he would not be responsible for what happens in my home. She discussed it with my physician who also thought it was a bizarre request to be made by a vet. By the time my physician was able to write the letter it was 1/7/09, after I took Simba to Norwalk VCA and she was out of Donald DeForge, DVM’s facility and back home. You will notice in his report of 1/4/09 (exhibit N) which he faxed to Norwalk VCA he states, “owner on anti-coagulant therapy and cannot give oral medicine at home.” This was a determination Donald DeForge, VMD made independently(possible violation of CVMA code of ethics section 3c,xv – see exhibit M2, possible violation of CT law). I had been administering medicine to Simba through a syringe by mouth and had no problems with her scratching me. I told this to the vet techs at Donald DeForge, VMD’s office and they stated they would relay the message to him. Donald DeForge, VMD is a vet. His patient was Simba, not me. His decision to refuse to send her home and to prescribe liquid medications harmed Simba, in my opinion. It should be noted VCA Norwalk had no concern about sending Simba home with me for care even after they were informed I was on Coumadin. Concern 4 – Medical Records: All of Simba’s medical records were requested by me on 1/19/09. I specifically asked for his case notes (exhibit O). On 1/23/09 I received a packet (certified mail 7008 2810 0001 6441 1012) with partial records from Donald DeForge, VMD. None of the medical notes on her care were included (see my certified letter to him exhibit P1, P2). This was urgently needed as Simba is now suffering from two serious medical problems, and her current vets do not know what was done to her, what medications were administered, how long she was on the medications, and what her vital signs were while at Silver Sands Vet Center. I have since requested a subponea on 1/26/09, from the Court for Simba’s records, through the office of Attorney Louis Rubano. Donald DeForge, VMD refused to comply with the subpoena. On 2/9/09 I was escorted to Silver Sands Veterinary Center by Officer Hoff of the Milford Police Department, at my request. Simba’s medical records were requested and Donald DeForge, VMD told the officer he wanted me off his property and refused to relinquish Simba’s medical records to the officer or me. On 2/11/09 Donald DeForge fed-x’d Simba’s medical records to my attorney. It should be noted there is one section in which ‘white out’ was used and re-written over. This is not medical protocol for medical records and I have been informed is illegal. There are also parts of the record that are missing. The AVM A policy VIII, E also states, “it is unethical for a veterinarian to remove the medical records or any part of the medical records.” (see exhibit T1). In my opinion, this was done as only parts of the medical record were sent to me. Post-surgery x-rays were requested (exhibit O) and never received. Donald DeForge’s website states that “extractions are never performed without pre and post extraction x-ray” (see exhibit B4). Donald DeForge, VMD never discussed his concerns about Simba with me in person. He sent an email on 1/6/09 stating that he didn’t want to see Simba and then, in my opinion, “dumped her from his care” a second time on 1/19/09 via letter (exhibit R). The AVMA policy states that “veterinarians have an ethical obligation to use courtesy and tact” when terminating the VCPR. In addition he failed to, “continue to provide care, as needed, during the transition” when he stated in writing he didn’t want to see Simba for 30 days. On 1/22/09 I received an email from him that he “missed the presidential inauguration” to send me Simba’s medical records (which are not complete ). He repeated this statement in his 1/29/09 letter. In my opinion, it is irrelevant and unnecessary communication for him to mention this to me. It came across as though he was ‘doing me favor.’ It is not a ‘favor’ to send a patient’s medical record so they may receive appropriate care; it is a medical responsibility. He has failed to send the complete medical record on Simba. His 1/19/09 letter (see exhibit R) to me begins, “I have been informed you are receiving medical care elsewhere.” If he is referring to anywhere besides VCA Norwalk, he never asked me about it or discussed it with me. In my opinion, he has “dumped” Simba as a patient based on hearsay or his assumption. His 1/29/09 letter states that he acknowledges that I have asked for Simba’s medical chart on three occasions. Conclusion: It is with deep and sincere regret I ever brought my beloved family member, Simba, to Donald DeForge, VMD. In my opinion, my cat has been treated in an unconscionable, neglectful, unethical manner by Donald DeForge, VMD and so have I. I will never return to him or his center. I am now praying that Simba lives. She entered his facility with no signs of renal disease and came out with renal disease. She also now has pancreatitis. She is on a feeding tube. In light of all the facts above I am entitled to a full refund of $4,406.90 from Silver Sands Veterinary Center. I would like your help in securing this. As of this date I have spent $2,500 in aftercare* at VCA hospital and my new vet hospital. I am entitled to the amount permissible by law as a refund for his misrepresentation and improper treatment. Treatment is continuing for subcutaneous fluids, feeding tube checks, prescription diet, tests and medications. I have also missed work without pay (loss of $408 per day) for days to care for Simba. I have also had to employ a pet sitter to come help Simba in the middle of the day ($16 per day) and a vet tech to come to the home ($20+ per visit) to instruct me on how to administer SQ fluids and change her neck wrap. The emotional distress of this experience is immeasurable. My experience is similar to that documented in a small claims court action filed against Donald DeForge, VMD, LLC on 9/9/04 in Meriden Court, SCA7-181198, Linda Papineau & Bonnie Penney vs. Donald H. DeForge, VMD, LLC. His behavior seems to be a pattern (exhibit W). Question (by Deforge’s attorney): Explain to me how you think Dr. Deforge’s treatment of Simba was reckless. Answer (by my guardian): Many ways. There was no diagnosis, so therefore no surgery should have been performed, from what I have been told, it was needless. It was extensive to the point where it was mind boggling. He allowed her to come home to me the day of the surgery and had no concerns about me being on Coumadin, but then all of a sudden supposedly developed this concern about me being on Coumadin and kept her there for 12 days. He didn’t allow me to visit her, which is very bizarre and also very detrimental to Simba. He didn’t weigh her. He didn’t do any test to find out why she was not eating. We’re not even sure if he administered any IVs or Sub-Q’s at all because that isn’t documented properly. He told me he was staying overnight with her twice and the record indicates that never happened. He told me he advertised to the public that he’s a dental specialist and he is not and never was. He often times would not communicate with me directly but messages were passed back and forth between the vet techs. He wouldn’t return my calls. He told me to put Simba in a dog crate and ignore her when she wasn’t eating. He inserted a feeding tube in her without discussing it with me. Question (by Deforge’s attorney): let me paraphrase for you because what you told me sounds like negligence…. 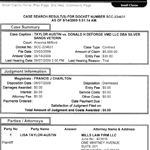 Is Donald H. Deforge’s own attorney admitting that Donald H. Deforge was negligent?